We arrived at Changi Airport at 9pm even though the meeting time was 11pm because the hubby was convinced that the departure time was 11pm. I didn’t argue with him because I thought it was safer to arrive early than late anyway so off we went. 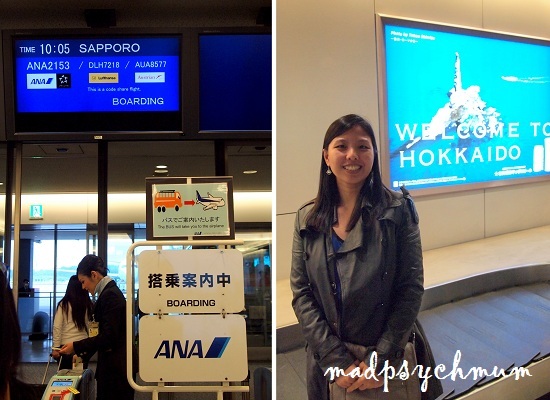 On arrival at Tokyo, we immediately transferred to a domestic flight at 9am. Although the Japanese immigration was very efficient, we only finally arrived at Chitose airport at 11am. Our tour guide, Matsumoto Ai, was a Hong Konger who married a Japanese so she is fluent in 4 languages (Cantonese, Chinese, Japanese & English). 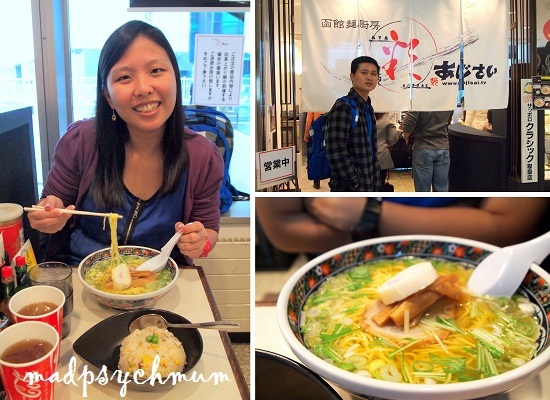 She greeted us at the entrance of the airport and ushered us to a typical ramen restaurant for lunch. The taste was ordinary but we slurped it down anyway as we were so hungry! 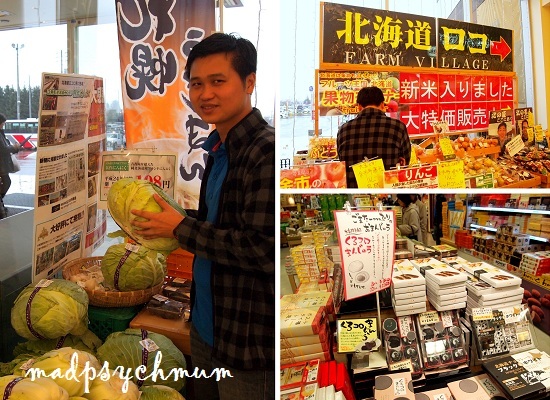 After satisfying our stomachs, we boarded the bus and were brought to the Mitsui Premium Park where many of the outlet stores for brands such as Coach, Michael Kors and Ralph Lauren were located. The hubby and I looked around but couldn’t find anything nice to buy. They were all too expensive! So instead, we headed to our favourite haunt to visit no matter where we are in the world..
Next, we continued on a long drive to Jozankei, which was famous for its hot springs. 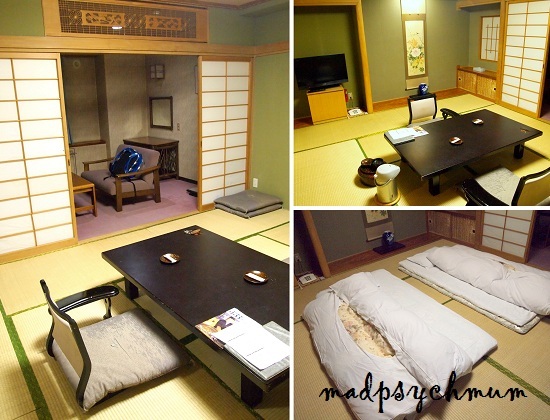 The hotel room was furnished with traditional Japanese furniture and even included a Tatami floor where we ate and slept. 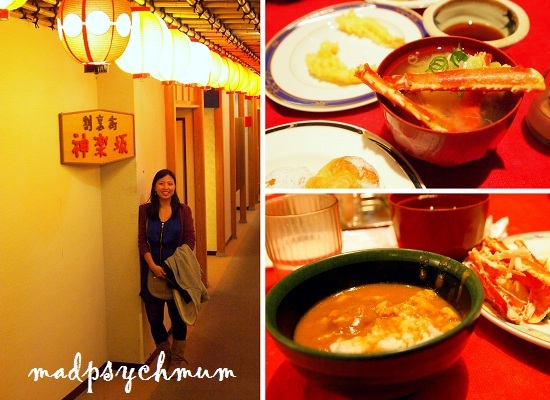 As it was already late, we decided to have dinner first before going to soak in the hot springs. I thought dinner was ok but the hubby was not impressed. Japanese curry was awesome though! We were super full from dinner so we had to rest for a while before heading down to the spa area. Although Ai san had explained to us the basic practices of Japanese at the hot springs, nothing could have prepared me for the cultural shock that I was about to encounter! Remembering that Ai san had also cautioned us not to act differently otherwise you would be stared at by the locals (although they did stare anyway since I was the only one there who didn’t have fair skin *sigh*), I followed suit and was soon bathing at one of the small cubicles. It is Japanese culture to bathe while sitting on a stool so that’s just what I did. I also followed the ladies into the hot springs and left my little towel at the side of the pool as nothing except your body can enter the hot springs according to Japanese ettiquette. The water was extremely hot that day but I was determined to soak in it for as long as possible! When I could no longer endure the heat, I switched to the outdoor pool where the cold winds could blow into your face as you soaked. It was an awesome feeling, to be able to admire the mountains while your body relaxed in the warmth. It was then that I wished my mum or sister was there (they are the only ones I allow to see me naked you see *laughs*) to admire the beautiful view with me! Wish I could take a picture of that moment but obviously I can’t bring my camera in so I could only capture it with my memory.